October 2016 Horoscope for Leo zodiac sign forecasts that most of the planets are in the house of family. Family issues and emotional stability will be vital and career concerns can be kept away for the time being. You are trying to understand your inner self and use your experience to solve present problems. Leo zodiac people can use their independence till the third week and complete their pending projects. After that, the planetary strength will move towards the rising sign in the natal chart which will make help of others important in attaining your goals. You will be bothered about what others think rather than interest in self development. Mid October 2016 will impact the individuality and academic interests of the Lions. Students will have conflicts in their scholastic activities. Relationships with neighbors and family members will be stormy. The Leo career October 2016 zodiac predictions will bring in changes to your profession. Your business or the organization itself will face many challenges. The long term prospects are brighter in spite of the short term disturbances. Monetary situation for the Leo personality is not very promising this month in October 2016. Earnings and accumulation of wealth will be slow. You have to balance your budget and all large investments should be done at a later date. Expenses on the home front should be done before the end of the month. The October 2016 Leo astrology forecasts predict that love partnerships will change for the better this month. All the planets connected with love are moving forward and this will result in committed relationships. Your family will help you in forming new partnerships. Romance and Leo sexual intimacy will be built on a strong emotional base for the Leos. Young Leo women of childbearing age have good chances of getting pregnant during the month. Health will be excellent till the end of October 2016 for the Leos. You have to take enough rest to maintain your well being. Vitality can be improved by working and eating smartly and knowing your priorities. Here are a few home remedies and aromatherapy tips that can be used for curing minor illnesses. 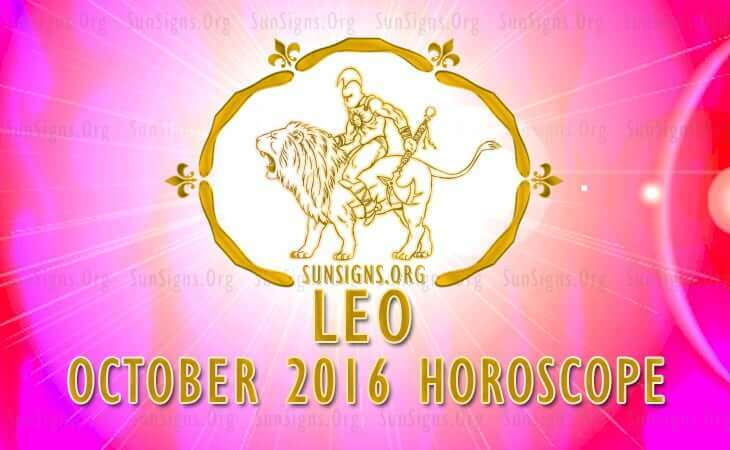 The Leo October 2016 horoscope foretells a month of quality time with loved ones rather than progress in career or finance.